Named for its rarely-used filler leaves from the Benevenuto region of Italy, CAO Italia is a different kind of full-bodied smoke. These dark-wrapped beauties are complex and heady with notes of cocoa, coffee, cinnamon, and spicy red pepper. And need I mention the construction? After all, it’s made by CAO, the guys who draw-test every one of their cigars before releasing them to the public. 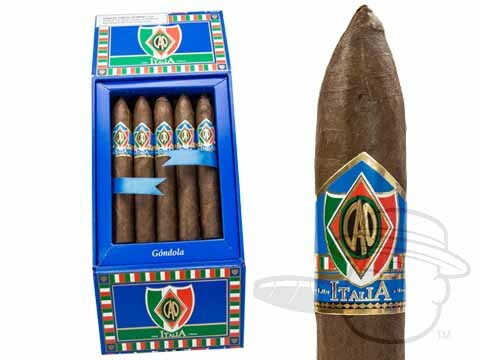 If you like your stogies strong, unique, and solidly-rolled, the CAO Italia is not one that you want to miss. Packed with flavor, deliciously unique Maduro taste without being bitter or over-the-top strong. Burn is unbelievably consistent with each stick, this cigar is so well constructed and has become my standard pairing with an aged bourbon - hats off to the CAO folks for this line. CAO produces several of my go-to, daily smokes and the Italia is one of them. Very good value. CAO Italia Gondola is rated 4.7 out of 5 based on 7 customer ratings.